Face.Damper is an innovative seismic control system that provides both aseismic and seismic control capabilities by connecting an earthquake-resistant panel to a frame using special connectors. 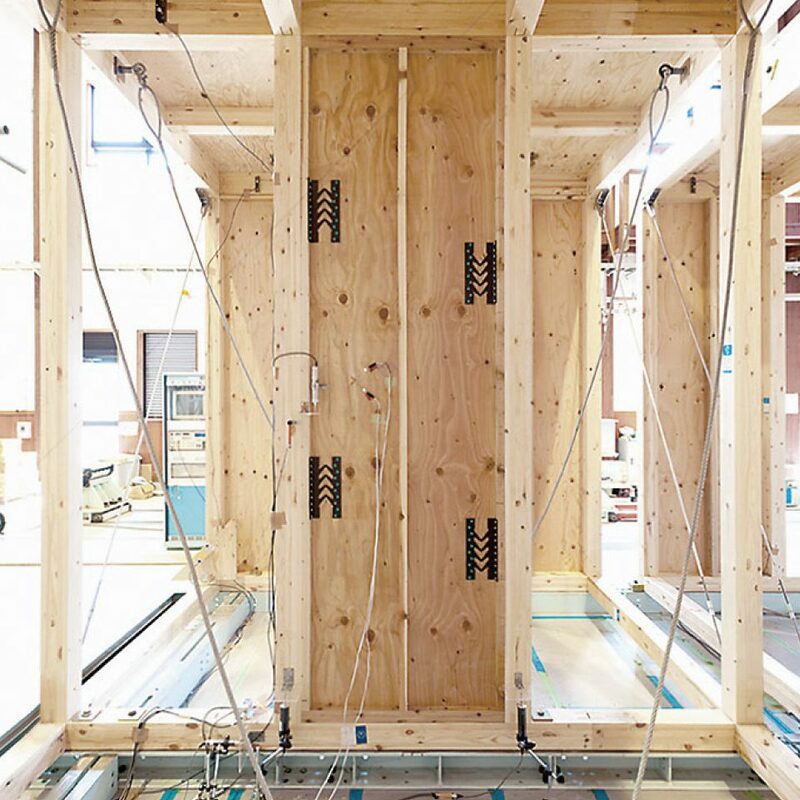 It allows for the use of commonly available building materials (except for the connectors), reducing the cost of earthquake-proofing compared to conventional seismic control systems. 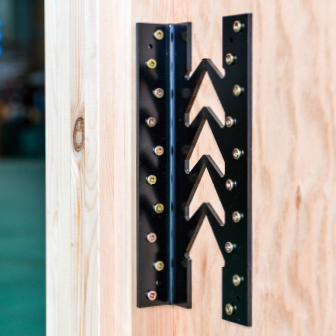 Face.Damper consists of a preassembled earthquake-resistant panel and dedicated comb-shaped connectors. With the optimized material and shape of connectors, Face.Damper can bend sinuously, as with a blade spring, in a major earthquake to absorb the vibration energy. It has also proven to be effective with repeated earthquakes by full-scale seismic testing. In addition, it is suitable for exterior walls owing to its temperature-proof properties. Two types of Face.Damper have Minister certification from the Ministry of Land, Infrastructure, Transport and Tourism. Conventionally, additional bearing walls are required to elevate the seismic grade. Face.Damper, however, can be counted as a bearing wall itself in a structural calculation, minimizing the number of necessary bearing walls. Therefore, Face.Damper can increase planning flexibility compared with other seismic control systems which do not function as a bearing wall. For a typical-size residential house with two stories, around four to six Face.Damper installed on the ground floor will be effective. *The required number of Face.Damper varies depending on conditions such as the building size and target seismic grade. Full-scale seismic testing verified that adding Face.Damper can mitigate up to around 74% of vibration. By suppressing vibration in a large earthquake, it can prevent the risk of falling furniture or building damage/collapse. Less damage to the building incurs lower repair costs after a major earthquake. Earthquake-resistant panels are premade in our factory before being transported to a construction site. 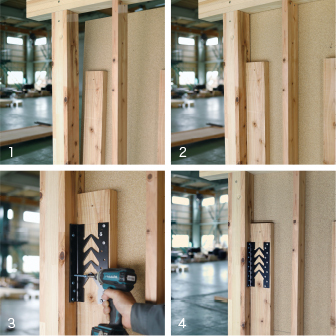 At the construction site, the panels can simply be installed by fixing to columns or beams using screws or nails without requiring special skills or tools. It is also suitable in renovations for seismic strengthening. A comparison test was conducted between two test buildings with the same total volume of bearing walls, one of which had some of its bearing walls replaced with Face.Damper. During testing, seismic waves were input seven times in total: one of middle scale and six of massive scale. The maximum displacement of the building with Face.Damper was continually smaller than that of the building without. After the fifth wave of input which simulated the Great Hanshin-Awaji Earthquake, the maximum displacement of the building with Face.Damper was only around 60% of the one without. 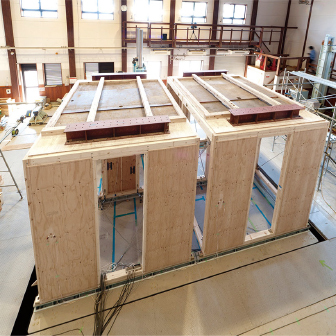 This result proved that, even when given the same bearing capacity, installing Face.Damper in part of a building can reduce displacement (based on the result of full-scale seismic testing conducted in August 2014). ※ Residual aseismic capacity rate indicates the percentage of remaining aseismic capacity after a disaster as compared with the original value.